Recently, we looked at life buried in sugar. But just how do you dig out from under it? You’ve probably heard more than a few horror stories about how hard eliminating sugar can be – tales of migraines, shakiness, lack of energy, irritability, and more. Fortunately, these withdrawal symptoms are only temporary. And there are ways to minimize suffering and keep yourself moving forward. You made the decision to toss the sugar, but why? Take a few minutes to jot down the reasons why it’s important for you to give up sugar. Maybe you want to lose weight, you have trouble going up steps, you were recently diagnosed with diabetes…. Whatever your reasons, write them down and carry this list with you everywhere. When the Oreos call you by your first name, let that “reasoning list” act as your rational mind. Let it let you refocus your bigger picture. If giving up sugar is good for you, it’s good for them – family, friends, and others you spend a fair amount of time with. But not all of them will be motivated to stop eating sugar. So you need to set your boundaries. No sugar in common spaces. No taunting or tempting. No complaining. Ask for support and set your ground rules before you start. Remember, you’re leading by example. If you complain and look unhappy, they will, too. So often, it’s the all-or-nothing approach that does us in. Cutting out sugar cold turkey can feel physically and mentally miserable. Hardwired to favor sweet tastes, we can only last so long before feeling deprived. A deep sense of deprivation will lead to failure. Better to quit in stages. Don’t bring new sugar or sugary products into the house. With the sweet stuff you already have, gradually reduce how much you eat. Eventually, you’ll exhaust your supply. By the time you do, the lack won’t be such a shock to your system. 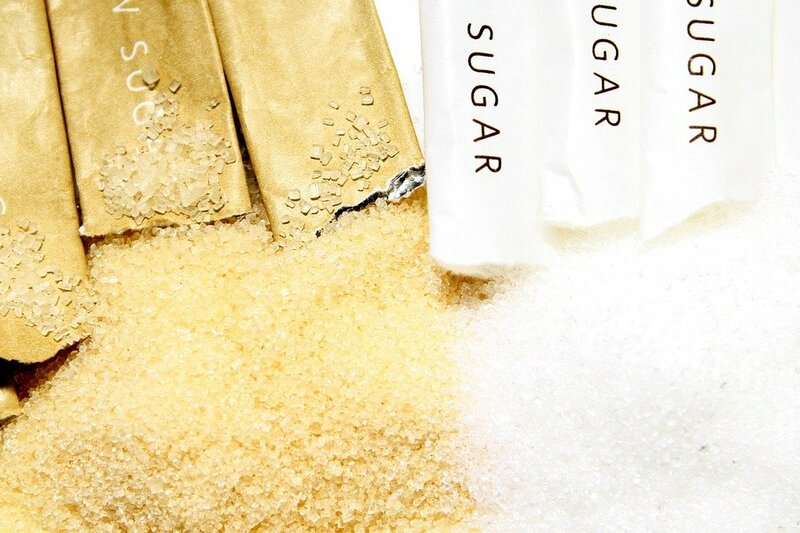 Getting rid of sugar is important, but while you’re at it, ditch the fake sugars, too. Sugar substitutes may seem a good compromise, but studies have clearly shown the damage they can do to our bodies, too. For instance, one study showed that daily diet soda consumption led to a 36% greater risk of metabolic syndrome and a 67% greater risk of type 2 diabetes. Other studies have shown that heavy consumption – 3 drinks a day – may, ironically, contribute to obesity. When it comes to processed foods, sugar hides everywhere. It goes undercover by more than 50 different names, with industry betting you can’t identify it. So you may need to do some detective work. Then you can do a better job playing bouncer. Don’t let anything on the list cross the threshold of your door. You’ve got this. There is a bounty of foods available for you to pick from. Giving up sugar and artificial sweeteners, you’re now retraining your taste buds. So practice mindfulness in your eating. When you eat, sit. Focus on eating. As you take time to notice the color, texture, and smell before bringing food to your mouth, your eating experience will be heightened. You’ll notice some foods have more natural sweetness than others. Some foods may have a sweetness you never had the palate to notice before. Enjoy it all. It’s really amazing how many foods you give up when you give up the added sugars – or, rather, food products. Most mass market breads, for instance, contain sugar. Likewise, many sauces and condiments. And, of course, ready-made meals or meal kits. We take so much for granted when we allow industry to cook and bake for us! If you find yourself challenged with what to eat, try new foods or explore recipe sites or food blogs. Check out a cookbook or two from the library, or make the commitment and buy a new one to inspire you. Many of the “trends in food” offer clean eating options. Want to know just how much sugar is in that packaged food or sugary drink you’re thinking about consuming? Do the math. And to do it, you just need to keep in mind that 1 teaspoon of sugar = 4 grams, and each gram contains 4 calories. So let’s use a Nestlé Crunch Bar for example. The label says 24 grams of sugar. Multiply that by 4 to get the number of calories from sugar: 96. Now divide that by the total calories in the serving – in this case, 220. Now you know that candy bar is 42% sugar. Want to know how many teaspoons of sugar that is? Just divide the total grams by 4. A Crunch Bar has 6 teaspoons of sugar. Either way, it’s a fascinating hobby and a great tool to teach children. With so much focus on diet, we can forget to move. Exercise for fitness is a necessity, but movement can come in many forms. Shoveling for ourselves or a neighbor, gardening, taking a group of kids on a hike – whatever it is, make it active. Engaged in activity, you may forget that feeling of deprivation you expected at the start. Remember you are in this for life. You’re not going to be “perfect” at giving up sugar. There will be temptations and celebrations and friends who want you to taste this or mothers who baked this fave thing “just for you.” Don’t be a curmudgeon. Trust that these special events are as it should be. Enjoy the gifts and the love, and carry on, sugarless, tomorrow.